Andrea King was born Georgette Andre Barry in Paris, France, however she lived there only two months before her mother, Belle Hart, brought her back to the United States. Belle was an ambulance driver on the front lines during World War I, as well as a dancer with the renowned Isadora Duncan. Andrea was raised in Forest Hills, New York, and Palm Beach, Florida, and adopted her stepfather’s surname of McKee when she began acting professionally at the age of 14. 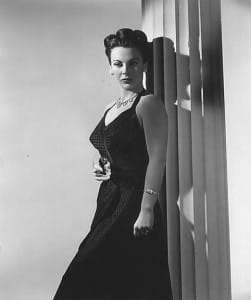 Prior to signing with Warner Bros. in 1944, she appeared in three Broadway plays and two national companies, and managed to squeeze in her first screen appearance in The March of Time’s first feature-length film entitled “The Ramparts We Watch” (1940). After signing with Warner Bros. and changing her professional name, Andrea’s career took off very quickly, and she appeared in nine films in 18 months. SheÂ appeared un-credited in the Bette Davis film, “Mr. Skeffington” (1944). The Warner Bros. studio photographers voted Andrea the most photogenic actress on the lot for the year 1945. 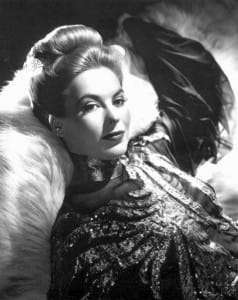 Her first leading role came early on with “Hotel Berlin” (1945), and until she left the studio system in 1946, she continued on as a glamorous, often mysterious leading lady. King was originally cast to play Dr. Lilith Ritter in Edmund Goulding’s film noir classic “Nightmare Alley”, but she choose instead a memorable role as sophisticated Marjorie Lundeen in “Ride the Pink Horse” (1947). Throughout the late 1940s and 1950s, she continued to work steadily in leading roles and “bad girl” second leads, and made many starring television appearances as well, most notably in the original 1953 live broadcast of “Witness for the Prosecution” for “Lux Video Theatre” (1950) opposite Edward G. Robinson. For her early work in television she received one of the first stars on the Hollywood Walk of Fame. In the early 1950s, she moved away from films and began making many television appearances on such programs as “Fireside Theatre”, “Cheyenne”, “Dragnet”, “Mike Hammer”, “77 Sunset Strip”, “The Donna Reed Show” and Perry Mason. Andrea continued to make occasional TV and film appearances through the late 1990s, until shortly before her death on April 22, 2003 from natural causes at the age of 84.